Jenkin Crag, Ambleside to Town End - Cumbrian Trail Guides - Mountain Bike Cumbria - beautiful trails and information from throughout the Lake District and beyond! Off-road - Single track, a good trail for the play rider, with nice technical sections! Waterhead, Ambleside. There is a pay and display car park located here. 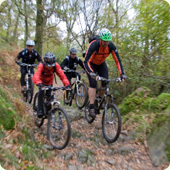 Starting at Waterhead car park, you will need to join the main road (A591) and ride down to Brockhole. When you are at Brockhole there is a brideway to the LEFT, ride up here for 1 km. At the end of this bridleway, you need to join the road going RIGHT, follow this for 450 meters. When you get to the net bridleway on your left, here. Follow it up, your now all off road until you get back to Ambleside. One you have ridden to the top of this, you know when you do it's levels off then, you need to go LEFT, up some more until you reach two gates. Take the LEFT one. This is a nice flowing downhill, with a few beck crossings and a (very) small drop off or two. When you get to the end of this you will reach two gates, go through them and then RIGHT. This takes you over a cattle grid, up a road to High Skelghyll farm. Go through the gates at the farm and you will have now reached Jenkin Crag it's self! No for 1 km you have a nice downhill/trail with all sorts of features, mainly rock, but watch out for the drop near the end, it might eat your wheel and throw you over the bars. After the really rocky bit you need to keep right and follow this to a road. Follow the road down and you will be in Ambleside / Waterhead. This trail has been viewed 49642 times!